The lake region, in northern Italy, is home of some of the most beautiful lakes in Europe thanks to its hilly and mountainous landscape and its micro-climates in which a unique flora developed. The art-de-vivre that has developed in that region is slow-paced and stress-free making at perfect destination for your holidays, in an incredible scenery, very far from your daily and tiring routine. Thanks to its abrupt landscape, this destination is perfect for hikes: follow the intertwining tracks that were used to go from villages to villages, head up to the first summits of the Italian alps and get to some of the most colourful and picturesque villages of this amazing region. Retreat destination for Winston Churchill after the second World War, Lake Garda is the biggest lake in Italy. Thanks to its micro-climate, an oasis in the middle of the alps, the lake Garda enjoy mild temperatures all year round, perfect for the local vegetation made of lemon, orange and olive trees, palms and cypresses. The abrupt landscape and small lakeside and hillside villages, both picturesque and architecturally magnificent, are activities to look for while travelling there. 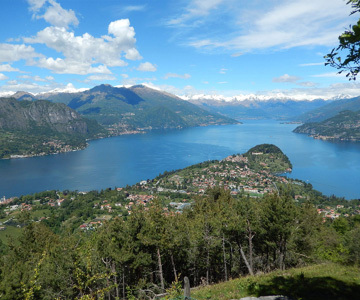 These characteristics makes the Garda lake a perfect destination for hike lovers. The lake Como is certainly the most romantic lake of the lakes region: with the likes of the picturesque villages of Varenna, Lenno, Bellagio and Tremezzina, enjoy strolling on the shore of this lake, surround by the mountainous landscape. 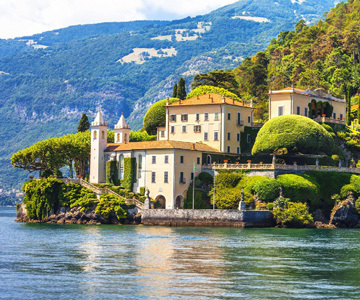 Several picturesque villages - such as Bellagio, Mennagio and many more - gardens and architectural masterpieces - such at the Villa Carlotta & Villa Balbianello - but also the hilly hikes are activites to look for whilst travelling to this Italian Lake. Lake Maggiore, second biggest lake of the Italian lake region, has some of the best paths to follow, both in its mountainous environment and in its quaint and colourful lakeside villages. With likes of the Borromean islands, Stresa and Arona, and sites likes the Villa Taranto, Rusconi-Clerci and San Remigio, enjoy the alluring historical heritage of the Alpine and northern region of Italy.